If you don't want to go to the gym there are plenty of DVDs available to guide you through a good workout. I came across this one at the Half Price Book Store for less than $3. 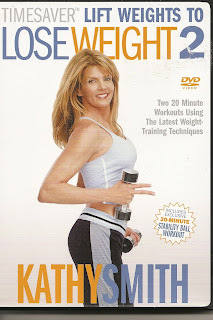 I'm trying to change my exercise routines so that I don't get bored and this DVD has several different workouts. Today was stressful at work and I craved potato chips all day, but chose to eat almonds instead - I've been buying the 100 calorie packages. I was going to mow the grass but the heat index was at 105 degrees this evening. Although I didn't feel very much like exercising I followed the Kathy Smith upper body workout and then did 30 minutes on the elliptical while watching Dr. Oz. Hey - halfway there and you're doing great. No chips! Proud of your willpower. Keep up the good work. I left you a Versatile award on my blog. Please check it out and pass it on. It's on my Everyday Life's Issues blog.